Alicia Wagner Calzada (J.D. ’10) spent two decades behind her camera lens as a photojournalist, capturing some of the most devastating, exciting and momentous events for magazines and newspapers. But it’s what unfolded off camera that has become her life’s work. Early in Alicia Calzada’s career as a self-employed photographer, someone stole her photograph. She previously had been a staffer for newspapers and magazines across the country, but as a newly independent photographer, she had to handle the business side of the industry for the first time. 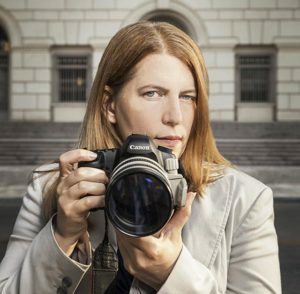 With no legal department to back her up, she turned to her trade organization, the National Press Photographers Association (NPPA), to educate herself on copyrights, contracts and running her own business. At that time, the NPPA didn’t offer many resources in this area, so it urged her to take the lead. She delved into these topics, even helping develop a cost-of-doing-business calculator that gave self-employed photographers a helpful, if sobering, look at their overhead and profits. But around the same time, photographers around the country were beginning to face an even bigger problem. It did not take long following 9/11 for journalists and citizens with camera phones to be increasingly harassed in the name of security. From news reporters photographing government officials to pedestrians recording what looked like an unlawful arrest, the stories grew more and more common. “There is a misconception among police, security guards and people who are in charge of keeping us safe that somehow a camera is a risk,” said Calzada. An image taken by Calzada during her coverage of Hurricane Katrina. Photo courtesy of RUMBO. Calzada is passionate about the Constitution’s First Amendment, which protects the freedom of speech and of the press. She emphasizes that if a person is lawfully present in a public space, he or she has every right to take photographs and to record video of anything in plain sight, whether a media badge is worn or not. Today, there are countless websites and blogs dedicated to reporting instances of people being wrongfully detained, arrested and even assaulted because they were taking photos or video. To her, the cause was personal. 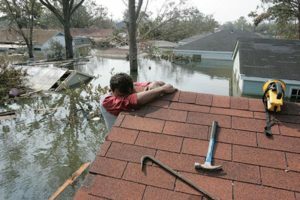 In 2005, she was shooting on location in New Orleans when Federal Emergency Management Agency (FEMA) officials essentially told her to turn a blind eye to some of the devastation she witnessed. Calzada is the founder of the NPPA’s advocacy committee, which defends photographers’ rights and interests, and tracks national trends in how the media is being granted or denied access. Similarly, her committee joined a national outcry when the New Jersey and New York transit authorities tried to ban photography in their stations. And in the early 2000s, when the National Football League tried to remove television affiliates and photographers from game sidelines, she sent letters to nearly every team and league in objection. The more she learned about the legal issues surrounding her field, the more she found herself trying to educate other photographers on the law. But she wasn’t an attorney. Now equipped with a law degree from St. Mary’s and decades of experience behind the camera, Calzada works in First Amendment media law, defamation suits and copyright defense as an attorney with Haynes and Boone, LLP in San Antonio. Her firm often lobbies on behalf of journalists, and one of its successes was helping push Texas’ Anti-SLAPP (Strategic Lawsuit Against Public Participation) Law. Texas’ Anti-SLAPP law is now one of the country’s strongest laws protecting individuals from lawsuits aimed at intimidating and silencing them. Not long after its passing, that law helped her firm successfully defend a local news station against such a suit. Today she represents corporations, journalists and the NPPA — but she still sticks up for the little guy. Case in point, a Chicago newspaper laid off dozens of its staff photographers this year, so Calzada flew to Illinois to coach them on the transition to independent and freelance photography. Projects on the horizon for Calzada include finding a small-claims solution for copyright infringement cases and promoting the Free Flow of Information Act in hopes of protecting journalists from improper intrusion into the media. And when she thinks about the ever-changing landscape in which photographers do business — online, on Facebook and on smartphones — she’s hopeful.